Over the past 12 years, I’ve accumulated several hundred bits of unfinished original writing. Ranging from fully written articles, to partial outlines, to research notes, to scrawled sentence fragments that I can’t even read. Though they span a wide range of topics, all of these pieces of writing have one thing in common: they are unpublished. They sit in a big, digital pile on my computer (and all my devices, thanks to the magic of the cloud!). Where these ideas were once a source of inspiration, they now cause me a tremendous amount of stress and guilt. I’ve accumulated an “idea debt” that has prevented me from moving forward with new ideas that are more exciting and more relevant to my goals. For years, I’ve had the intention of one day returning to each and every one of these ideas, giving them the full attention they deserve, updating them for today, and publishing a steady stream of original writing that will inform, inspire and dazzle everyone from my mother to yours. Today, I’m writing this article instead. This is the article where I acknowledge that the notion of revisiting and fully developing hundreds of old ideas, each one waiting for the perfect moment that never comes, has done me far more harm than good. This is the article where I try to find peace in letting go of the past, and where I release ideas that have languished under my care back into the wild. This is the article I’m writing in place of hundreds of others that might have been. It is, I hope, a fresh start. Ideas are like animals in the woods. You don’t know where they came from, and you don’t know where they’re going. Some are beautiful, and some are scary. Most, you never even notice. If you’re lucky, you might connect with one for a moment. Snap a twig and they’re gone. The great thing about having ideas is that it’s automatic. It happens all the time, whether we want it to or not. If you’re alive, you’re having ideas — and forgetting them, too. This coming and going of ideas is normal and healthy. Our brains aren’t meant to remember everything, and it’s actually a good thing that we don’t. When we’re lucky enough to get interesting ideas, it’s good to write them down. Because I am a living human, I get lots of ideas. I also tend to make a lot of notes. I’m always capturing a new thought, new idea for an article, a website, app or game. I scribble them in moleskines, save them in software programs, and reserve bits and pieces of my brain for them. Capturing ideas isn’t a bad thing, but my problem started when I failed to develop the captured ideas to completion and release them back to the world as something new. I would write drafts of articles, but never finish or publish them. I had ideas for things I wanted to say, but then I didn’t say them. I hadn’t just captured these ideas. I had trapped them. Like animals, ideas require care and upkeep. Ideas want to be fed, cared for and interacted with so they can grow and become something more. If you capture one and then don’t take care of it — say, by developing it, writing about it, building upon it — it’ll waste away. Over the years, all of my capturing and trapping led to a pretty big pile of underdeveloped ideas. I dragged the pile of ideas between cities, between jobs, and even between ideas about who I was or wanted to be. While everything else in my life changed in many ways, the pile of ideas changed in only one: it grew. This sounds like a hoarding story, and I guess it is, but not like the ones on TV. My old ideas weren’t physically getting in my way like thousands of coke bottles or sixty three cats might, but they were most definitely blocking me in other ways. I always kept things neatly organized in notebooks and folders, so their physical and digital footprint was minimal. Their mental and emotional footprint, however, became enormous. Like people who hoard animals, I meant well. I did care about my ideas, and I wanted to do right by them. By taking them in, I thought I was giving them a good home. But by collecting so many, I couldn’t care for any of them well. Over time, my pile of ideas transformed from inspiration to impediment. I was feeling stuck, but it wasn’t writer’s block. I continued to have new ideas, and continued wanting to write. It felt more like gravity — a pull to go back to old ideas and deal with them before I could be “allowed” move on. At the same time, whenever I did try to develop one of old ideas into something more, I quickly got stuck. What was I really trying to say? How was publishing this going to help me? Did I even care about this topic anymore? Just because I had thought something was interesting a year or three ago didn’t mean it was relevant to me now. I also wondered if the problem was simply me. Why couldn’t I bring myself to finish a simple article? Was something wrong with my process? Had I forgotten how to think? Was I fundamentally flawed in some way? My “idea debt” was accumulating interest by the day, and it started to seem insurmountable. 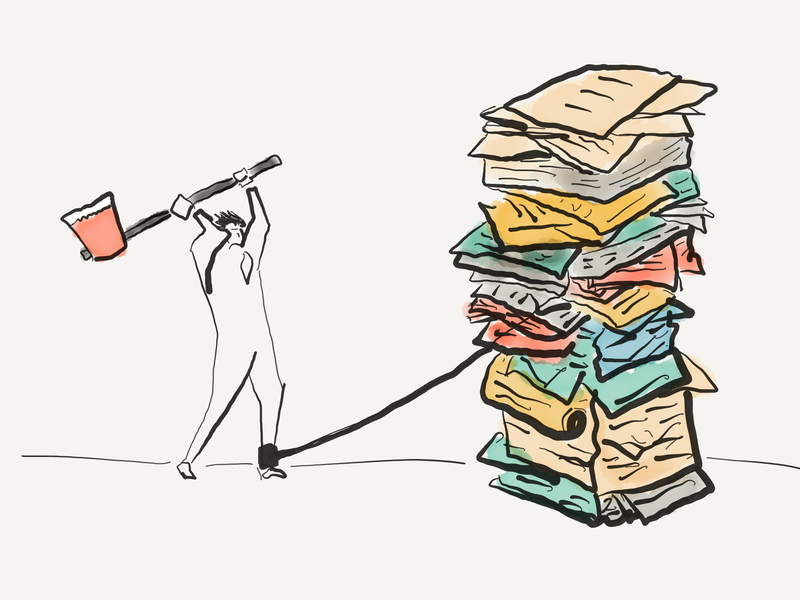 The path from “pile of unfinished work” to “debilitating self criticism” is surprisingly short. Following the years of struggling over this topic, real progress came only when I opened up and asked for help from my friends. In the past few weeks, I’ve had some great conversations about these old ideas that helped me get unstuck, especially from my friends Deanna Moffitt and Clay Ostrom, and my wife Katie Thomas. I could fill another article about how I’m not very good at asking for help, so simply asking was a small victory in itself, but I’ll save that story for another time (*adds it to the pile*). My friends agreed that writing fully fleshed out articles about all of these old ideas wasn’t realistic, nor was it necessary, or healthy to even try. To move forward, I had to accept that I was never going to deal with these old ideas in the way I had originally envisioned: you know, by producing hundreds of thoughtful, well-researched articles that were accessible, useful, a little bit funny, and honestly really just resonated with lots of people. But at the same time, I didn’t want to simply trash and delete them all without any sort of acknowledgement. There had to be a meaningful alternative, some story or insight to share. Eventually, we found a solution. The key was to realize that my pile of ideas was no longer just a pile of ideas. The Pile had become its own thing — a collection of once innocent ideas that, through neglect, had petrified. Just as making minimum payments on overwhelming credit card debt will keep you stuck forever, We couldn’t solve this problem by working on The Ideas individually. We had to focus on The Pile itself. So here’s what we came up with: what if I allowed myself to put all of the ideas — the entire Pile — to rest in a formal way. To get the fresh start I wanted so badly, I had to declare a kind of “idea bankruptcy” and wipe away all the debt at once. At the same time, simply trashing everything without any closure also felt kind of irresponsible. So we had one more idea: to give the ideas some Last Rites, a short summary for each one on a list, then consider all of the old ideas resolved (I was raised Catholic, so this is not offensive). I love this idea, so that’s what I’m doing. Please, bow your heads. I’ve compiled a list of all the old ideas that were worth some sort of acknowledgment in a separate post. It’s just a huge list, and you’re welcome to skim through it for fun. That is, of course, if skimming through almost 12,000 words of half-baked ideas sounds like fun. Here it is: The Pile of Old Ideas (volume 1). So what did I learn through this experience? I learned that the things you write are a reflection of who you are and what you want when you write them. But those things — your direction, your goals, your sense of self — can all change. And when they do, the things you think about and write about should change too. One major reason I got stuck on these ideas is the huge amount of change I experienced in my personal and professional life over the past decade. Since 2004, I’ve lived in six major cities, made at least five major career shifts, started several businesses, and got married. Nearly every aspect of my life changed, but the pile of ideas didn’t adapt accordingly. Because I was changing but this collection of old ideas was not, over time it drifted further and further out of sync with me. Returning to the old ideas started to feel like more and more of a burden, and simply adding new ideas on top of the old ones didn’t make things better. I couldn’t effectively move forward with new ideas while the gravity of the old ones kept pulling me back. My map of Chicago doesn’t help me in Los Angeles, so there’s no need for me to carry it around. By writing this, I want to formally let go of not only The Pile of Ideas listed above, but also my own past ideas about myself. To create space for brand new ideas that come from the here and now. Because moving on from the past is really about seeing the present, and the future, in new ways. And, while I’m at it, I want to throw in just a little bit of self-forgiveness for not turning every single marginally interesting idea I’ve ever had into a goddamn Pulitzer Prize. It turns out that there are a few legitimate, non-self-deprecating, reasons why I struggled to turn my pile of ideas into something useful. Instead of some deeply rooted cosmic flaw with my character, most of my struggles were rooted in good, old-fashioned lack of focus and unclear goals. Even if I had published all of those articles, without a clear goal and focus they probably wouldn’t have added up to anything meaningful. If my story strikes a chord with you, please let me know. I’d love to know that I’m not the only person who has been through an experience like this. So if you’re still reading, here’s what I’d like you to do. Think of something you’ve been holding onto — some idea for an article, a project, an app, a screenplay, whatever. An idea that you captured with good intentions, and has since become trapped. Then release it. Leave a comment on this article, and/or tweet to @heyjohnsexton to share that idea and let it go. Release it back to the wild so it won’t be a burden on your anymore. Give yourself permission to let it go. And who knows, you might just inspire someone else in the process.